Like the other major early French fortepiano makers (Pleyel, Freudenthaler), Erard was German, born Erhardt in Strasbourg, Alsace, in 1752. Trained in Paris as a harpsichord maker, he built his first square piano in 1777 and his first grand piano in 1796, on returning from London, whither he had fled to escape the Terror. By the beginning of the nineteenth century, both Paris and London factories were producing large numbers of harps and English action fortepianos, both squares (of which the Schureck Early Keyboard Collection possesses one of 1814, similar to those made for Marie Antoinette in 1787 and later for Napoleon at Malmaison) and grands, examples of which were made for Haydn (1801), Beethoven (1803), Napoleon (1810), George IV (1829) and Queen Victoria (1845). By 1845, London Erards were seriously eroding the sales of Broadwood, with whom they shared the Royal Warrant and from whom they snatched, in a controversial decision, the gold medal at the Great Exhibition of 1851; a further gold medal was awarded at the Paris Exhibition of 1855. Erard was a great innovator. By 1809 he had invented the agraffe, a strengthening device giving downward bearing on the strings, and in 1821 he patented one of the greatest technical advances in the history of the piano, the double escapement grand action, making rapid key repetition reliable for the first time; all modern grand actions are developments of this, so that in a sense all modern grands are descended from Erard. Though Liszt on occasion played Viennese action instruments (the Dannhauser group portrait of 1840 shows him playing a Graf to Rossini, Paganini, Dumas, Hugo, George Sand and Marie d’Agoult, and he is known to have used a Bosendorfer at an 1872 charity “command performance” in the presence of Kaiser Franz Joseph), he clearly preferred English action pianos. His first public concerts in 1824 (Paris, 7 March; London, 21, 29 June) were played on “Sebastian Erard’s New Patent Grand Piano Forte”, and a lithograph by Leprince of the same year shows him seated at an Erard square; his satisfaction is evident in the dedication to Sebastian Erard of his Huit Variations, Op. 1 of 1825. Liszt gave the first public piano recital, i.e. concert devoted exclusively to solo piano, in Paris in 1839, and continued to prefer the reliable, robust Erard instruments throughout his “virtuoso” Paris period (1839-1847). His example was followed by other klaviertigers such as Thalberg (1812-1871), Rosenhain (1813-1894), Dohler (1814-1856), Henselt (1814-1889), Wolff (1816-1880) and Dreyschock (1818-1856); Chopin (1810-1849) alone preferred Pleyel pianos, though paid tribute to the consistency and reliability of the Erard action, and used an Erard grand, with those of Broadwood and Pleyel, on his London tour of 1848. Anonymous sketches of Liszt’s music room at the Altenburg during his Weimar period (1848-1861) show an Erard grand, together with Beethoven’s 1817 Broadwood, which he had acquired from Spina in 1845, and a grand with a pedal board by Alexandre of Paris. Wagner, perhaps on Liszt’s advice, accepted the gift of an Erard grand in 1858, and used it until his death; though most of Wagner’s too little known piano music had been written by this time, it is quite possible that the Wesendonk Lieder (30 November 1857-1 May 1858) were composed, at least partly, at this instrument. 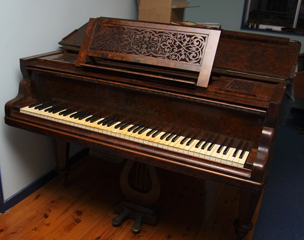 The Erard company, so technically innovative at the outset, retained straight stringing and timber frames until the end of the nineteenth century, thus falling technologically behind Steinway and the German makers who followed them in adopting cross-stringing and cast metal frames. Liszt’s commitment to Erard remained firm until around 1870, from which time he was given a new grand each year by Bechstein, whose first grand (1856) had been inaugurated by von Bulow with Liszt’s sonata in b minor. Production declined to the point where the London factory was closed (1890); the Paris branch then belatedly introduced new models, reluctantly and too late to recapture lost markets, and was, in spite of Paderewski’s enthusiastic advocacy, finally amalgamated with Gaveau in 1960.